Today’s average bowler is more of a strike shooter than a spare shooter. He takes careful aim; he concentrates on the strike shot; but on spares he tends to get a little lax. This is a costly mistake. Spares are of prime importance, and should be granted as much, or more, concentration than the normal strike delivery.Without the spare credits on your score, the strike balls aren’t nearly as important as they might be. I tell my pupils to make their spares the strikes will take care of themselves. When attempting to convert spare leaves, always keep these two cardinal rules in mind:1)Position yourself on the approach diametrically opposite your pin leave. Give yourself as much lane to shootover as possible. If your pin leave is on the left side of the pindeck say the 7-pin position yourself to the right of the approach.2)Always face your work. 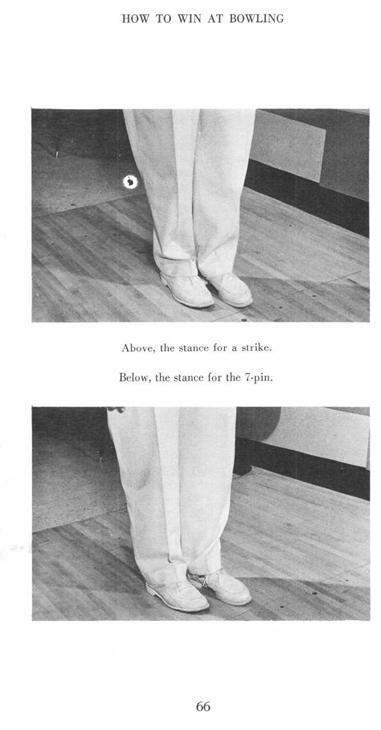 By this I mean, turn your feet and your shoulders, your whole body, directly facing the pins you are aiming at. This will insure that your pendulum swing in spare shooting is the same as it is when you are angling for strikes.Let’s look at some individual spare shots and see just how they are best converted. This entry was posted on Sunday, October 30th, 2005 at 11:50 pm	and is filed under Bowling. You can follow any responses to this entry through the RSS 2.0 feed. Responses are currently closed, but you can trackback from your own site.